One word. Pinterest. You’ll find plenty of inspiration there to get your creative juices flowing. But do remember that you don’t have to be overly creative, or an artist, to be seen as creative by your kids. Alissa, from Creative With Kids, believes that everyone is creative, and I agree. Creativity doesn’t just lie in art and craft projects. You can be creative in the kitchen, with organizing, and almost with anything else. 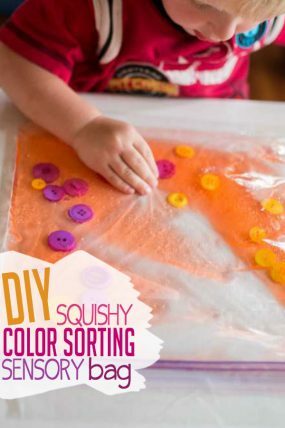 Divulge into your creativity and find a way to enjoy it with your children. Most of the time, just by starting the activity or project itself with the kids, brings out my own creativity. I’m not a teacher. So most of the time I have no idea what my kids are learning… but believe me, they are learning. Whether it’s a ‘learning’ activity, or not, they are learning. Every single thing they do during playtime, or hands on projects, kids learn from it. 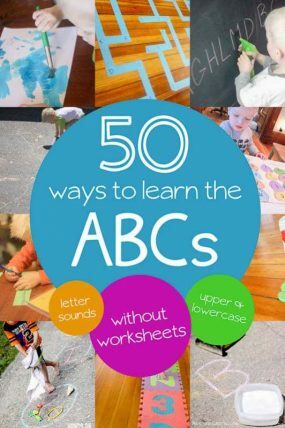 It could be intentional learning that I planned for, like the ABCs, 123s, shapes, colors, etc. or it could just be learning to follow along step by step, or listening, or taking turns in a game, that just happens as they’re watching me or by doing an activity. Every little thing is a learning opportunity for them. I’ve got a baby. It just doesn’t work. A baby most generally sleeps. This is when I do our hands on activities the most. If it doesn’t pan out that way (because a lot of times it doesn’t), we try to incorporate George into the activity, if possible (not always possible), otherwise I set him up to do something ‘contained’ in his high chair. I do this if what Henry and I are working on will be destroyed in the event that George comes along. When I do try to incorporate George into the activity, I try my best to make sure he has something to do. Whether it’s the same thing that Henry and I are doing, or if its something slightly different, but with the same ‘tools’ that we’re using. A lot of times, he likes to watch from the sidelines holding onto the same tools that we’re using, doing his own thing. I’m so not organized enough to do this all the time! How do you do it? Me neither. I’m not organized at all. Hey, I used to be. I used to be the geeky spreadsheet lady and would have all of this charted out weeks ahead of time. But kids happened. Organization has taken a huge back seat. Most days I plan in the moment. Henry asks me to do an activity or an experiment and we figure something out together. I know that doesn’t always happen, especially when you’re first starting out. But I do keep a log of activities, crafts, art projects in the back of my mind to do ‘someday’. Pinterest is great backup. Often, I’ll bring up my “Get the Kids Moving” board when its one of those days and we just need some distraction. 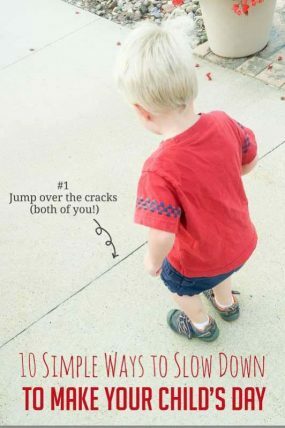 There’s my ten most common hurdles to being hands on with the kids. I’m not saying that my answers to these hurdles are the best and most effective. It’s just what has worked for us! I hope this will inspire you to become a little more hands on with your kids just by spending some wonderful quality one on one time with them. What’s your biggest hurdle to be hands on with your kids? It’s simple to be hands on with your kids. Please share what is to be a hands on mom! 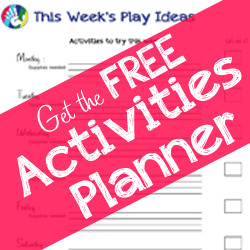 FREE Printable Kids Activities Planner! 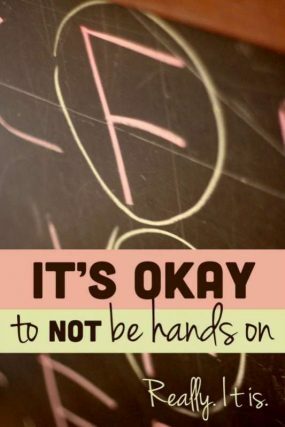 It’s Okay to NOT do Hands on Activities with the Kids. Really. It is. I needed to read this. I will share on my facebook page. Thank you. You’re welcome. And thank you for sharing Lucy. Wow. Love your site! My daughter sent me a link to your 30 Ideas post, and it is really fun to look around at all the ideas you have. We are in the grandparent stage now, and they are 1 and 2. Your activities and philosophy are just great. 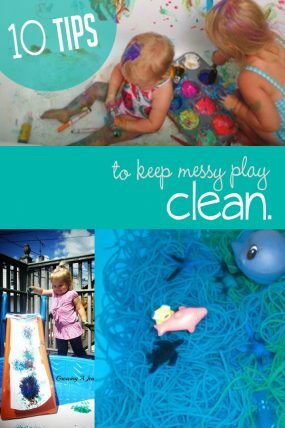 It is really good to be reminded about how to gear activities to their level, embrace the mess, and let them explore. I can’t wait to try some of these with our grandkiddos. Thanks! Thank you. Learning about your child is so important! :) And thanks for the link! I AM an early childhood teacher, you are absolutely right, you may not know what your kids are learning, but they ARE. Often, it’s social skills, creative thinking, problem solving and emergent (very beginning) reading and math skills. These are the priceless things that we can give our children that all too often the public/academic schools miss out on. I’d advise parents to read, read, read about play and the benefits of time spent doing everyday tasks. Teaching the little ones manners, self help skills, independence, and the benefits of having a job that contributes to their families. Planned activities are great, but there is also a lot of learning happening during these times. This is a really great post…I’m glad I found it via pinterest and took the time to read it. I have a lot of the same hurdles with doing artsy crafty stuff with my two year old daughter (especially since I am eight months pregnant now) so this was great motivation for me. Thanks! Thank you Emily. I hope it inspires you to be hands on with your daughter! It is really difficult at times, so I really understand where you’re coming from. I’m not big on messes myself, but I have found times to work a mess in. I’m getting ready to sweep and mop the kitchen floor? Time to turn the kids loose with play-doh and the various baby cutlery, yogurt lids and actual Play-Doh accessories for a bit first. Your post is very encouraging and I will likely read it again and again. Time with my children is priceless and fleeting. I don’t want to waste it hanging onto my flimsy excuses. They are worth the effort it takes to get over myself (or just work around myself – lol)! Oh thank you. I love your plan ahead for letting it get messy. I do that with the windows. If they really need washing, that means its a day for painting the windows first. The kids love it. Great post! My Little Man is just getting to that stage where he can start doing more activities, too. I just started incorporating “lesson plans” and activities into our day. Thanks so much for the encouragement! Great post! I’m sharing it on my FB page for my website at teachmetotalk.com. This is such important information for families, especially for parents with kids with developmental delays. Thank you! What a great post….thank you, i really enjoyed reading it! I love mess with my twins but am often asked why i bother or get told ‘i am so brave’! Honestly, as long as you are a litle organised, activities really don’t take much time and i think a happy and busy toddler is worth it to my sanity!!! I have a kids get moving board too and just invited you to my toddler board! Great article. I appreciate the link to the “Get the Kids Moving” board. Jamie! I want to share this post with all of my classroom parents…and my sisters…and my coworkers…and my mom! You hit the nail right on the head with this one! Thanks for this post. Really. You rock! Thanks for sharing your wisdom. You are so right, I have a very active guy and find myself making excuses. This is a great reminder why not to . YEAH! You did a beautiful job Jamie. Hope we see lots more like it in the future! I love every point you made… especially #5. We need to think of spending HANDS ON time with our kids as much of a priority as cleaning, or cooking. One thing that I’ve realized as I’ve talked with friends is that there are so many ways to be “hands on.” I think some moms use their creativity to make amazing activities and crafts with kids and some moms are great at taking their kids on field trips to interesting places or just engaging them in extracurricular activities and being there to support them, hug them, give them high fives, etc. 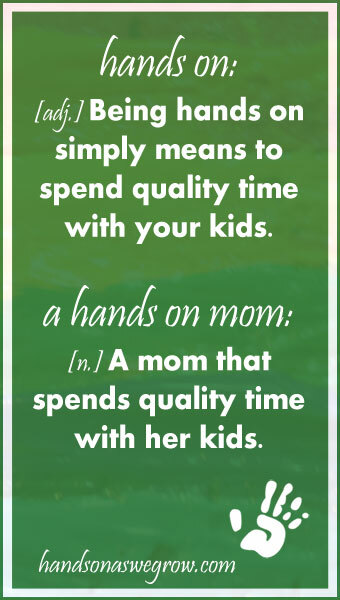 I don’t think moms need to create daily activities or crafts to be hands on, but rather like you mentioned, spend quality time with their kids in however that works in their family. I love hearing about how different families successfully accomplish this! Jamie, this is a great post! 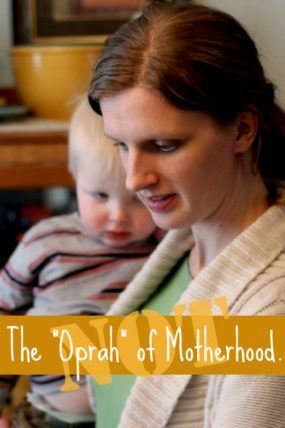 I think a lot of Moms will relate to what the perceived challenges are in being a Hands On Mom. I know I felt the same way when my own two were little. Now that I’m running a daycare, and I’ve learned to embrace mess, and not worry if they don’t do the craft the way it’s supposed to be done etc., it’s so different. Every day I see the benefits that come from making the time and the space for the craft, and encouraging even the youngest to participate. Happy kids, creative kids. 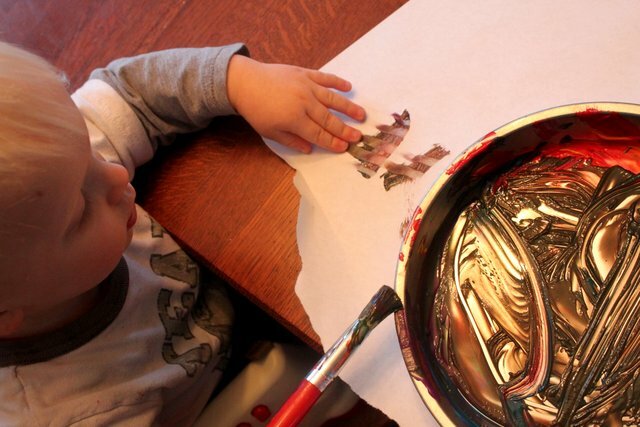 Kids who love to get messy and explore and experiment with the materials they’re provided with. And it’s so rewarding for me as well. Thanks for spelling it all out here. I’m on my way to share this now!